Not to be confused with torsion beam suspension. A torsion bar suspension, also known as a torsion spring suspension, is any vehicle suspension that uses a torsion bar as its main weight-bearing spring. 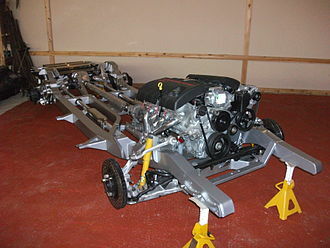 One end of a long metal bar is attached firmly to the vehicle chassis; the opposite end terminates in a lever, the torsion key, mounted perpendicular to the bar, that is attached to a suspension arm, a spindle, or the axle. Vertical motion of the wheel causes the bar to twist around its axis and is resisted by the bar's torsion resistance. The effective spring rate of the bar is determined by its length, cross section, shape, material, and manufacturing process. 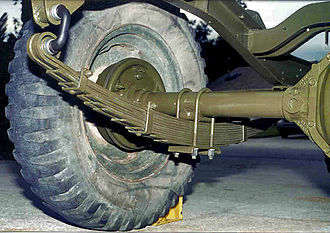 Torsion bar suspensions are used on combat vehicles and tanks like the T-72, Leopard 1, Leopard 2, M26 Pershing, M18 Hellcat, and the M1 Abrams (many tanks from World War II used this suspension), and on modern trucks and SUVs from Ford, Chrysler, GM, Mitsubishi, Mazda, Nissan, Isuzu and Toyota. Manufacturers change the torsion bar or key to adjust the ride height, usually to compensate for engine weight. While the ride height may be adjusted by turning the adjuster bolts on the stock torsion key, rotating the stock key too far can bend the adjusting bolt and place the shock piston outside its standard travel. Over-rotating the torsion bars can also cause the suspension to hit the bump-stop prematurely, causing a harsh ride. Aftermarket forged-metal torsion key kits use relocked adjuster keys to prevent over-rotation, and shock brackets to keep the piston travel in the stock range. The main advantages of a torsion bar suspension are soft ride due to elasticity of the bar, durability, easy adjustability of ride height, and small profile along the width of the vehicle. It takes up less of the vehicle's interior volume than coil springs. Torsion bars reached the height of their popularity on mass-production road cars in the middle of the 20th century at the same time that unitary construction was being adopted. 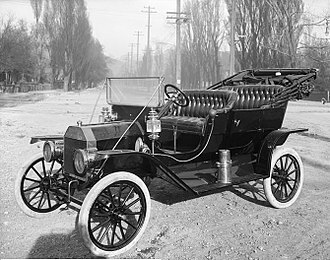 At a time when the mechanics of stress and metal fatigue in monocoque body frames was poorly understood, torsion bars were very attractive to vehicle designers as the bars could be mounted to reinforced parts of the central structure, typically the bulkhead. Using MacPherson struts to achieve independent front suspension with coil springs meant providing strong turrets in the frontal structure of the car. A disadvantage is that torsion bars, unlike coil springs, usually cannot provide a progressive spring rate. In most torsion bar systems, ride height (and therefore many handling features) may be changed by simply adjusting bolts that connect the torsion bars to the steering knuckles. In most cars with this type of suspension, swapping torsion bars for a different spring rate is usually an easy task. 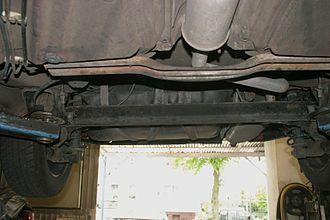 Longitudinal torsion bars extend under the passenger compartment, cutting into interior space by raising the floor, while in transverse systems, torsion bar length is limited by vehicle width. Some vehicles use torsion bars to provide automatic levelling, using a motor to pre-stress the bars to provide greater resistance to load and, in some cases (depending on the speed with which the motors can act), to respond to changes in road conditions. Height adjustable suspension has been used to implement a wheel-change mode where the vehicle is raised on three wheels so that the remaining wheel is lifted off the ground without the aid of a jack. Before World War II (1934), the front wheel drive Citroen Traction Avant had independent front torsion bar suspension and a flexible trailing dead axle, also sprung by torsion bars. The flexibility of the axle beam provided wheel location features like a twist beam axle. Also in the 1930s, prototypes of the first Volkswagen Beetle incorporated torsion bars—especially their transverse mounting style. Czechoslovakian Tatra's 1948 T600 Tatraplan employed rear torsion bar suspension, the only Tatra to do so. The system first saw military use in the Swedish Stridsvagn L-60 tank of 1934. It was used extensively in European cars like Renault, Citroën and Volkswagen, as well as by Packard in the 1950s. The Packard used torsion bars at both front and rear, and interconnected the front and rear systems to improve ride quality. Morris Minor and Oxford from the late 1940s onwards used a front torsion bar system very similar to the Citroen, as did the Riley RM models. The revolutionary Jaguar E-Type introduced in 1961 had a torsion bar front suspension very similar to the Citroen and Morris Minor, and an independent coil spring rear suspension using four shock absorbers with concentric springs. An early application of a torsion bar in an American car was by Hudson Motor Car Company of Detroit who had introduced the innovative front axle flex suspension in 1934 Hudson and Terraplane cars and realized for 1935 that a transverse torsion bar linked to the rear axle was needed as an anti-roll bar to stabilize the cars. 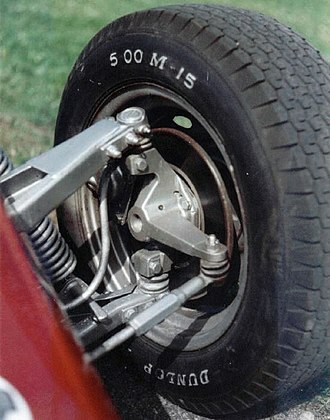 The single torsion bar was mounted through the frame sides behind the rear axle and then attached by arms and links to the front side of the spring U-bolt plates. Axle flex was discontinued for the 1936 model year. Post-war the use of torsion bar front suspension was a defining feature of British Morris cars, starting with the Morris Minor of 1948, its larger Morris Oxford MO counterpart and the upmarket Morris Six MS, plus the Wolseley-badged upmarket variants of the latter two models. The designer of these cars, Alec Issigonis, was inspired by the Traction Avant's suspension, although the Morris cars were rear-wheel drive and used conventional leaf springs for their rear axles. The Minor used lever arm dampers with its torsion bars while the Oxford and the Six used innovative telescopic dampers. 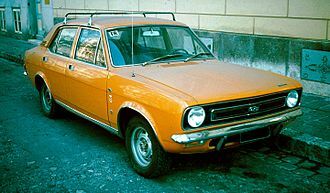 The Minor remained in production largely unchanged until 1972 and was replaced by the Morris Marina which also used the torsion bar-lever arm damper system for its front suspension—one of the last new cars worldwide to be introduced with the system and which remained in production until 1984. The Oxford/Six platform was developed through several revised series which used Issigonis' torsion bar system until 1959 when the new Farina Oxford was introduced using front suspension with coil springs, lower wishbones and lever arm dampers. The most famous American passenger car application was the Chrysler system used beginning with the 1957 model year in cars such as the Imperial Crown series, although Chrysler's "Torsion-Aire" suspension was only for the front; the same basic system (longitudinal mounting) was maintained until the 1981 introduction of the K-car. A reengineered torsion bar suspension, introduced with the 1976 Dodge Aspen, introduced transverse-mounted torsion bars (possibly based on the Volkswagen Type 3 passenger car) until production ended in 1989 (with Chrysler's M platform). Some generations of the Dodge Dakota and Durango used torsion bars on the front suspension. General Motors first used torsion bars on their light-duty pickup trucks in 1960 until it was phased out in 1963 where traditional coil springs are used up front for their 2WD trucks. Its first use in a passenger car was in 1966, starting with the E-platform vehicles (Oldsmobile Toronado, Cadillac Eldorado), 4WD S-10 pickups and Astro vans with optional AWD, and since 1988, full size trucks and SUVs with 4WD (GMT400, GMT800, and GMT900 series). Porsche used four-wheel torsion bar suspension for their 356 and 911 series from 1948 until 1989 with the introduction of the 964. They are also used in the front suspension of the 914 as well as the rear suspension of the 924, 944, and 968. Honda also used front torsion bars on the third generation Civic and other variants built on the same platform including the Ballade and first generation CRX. 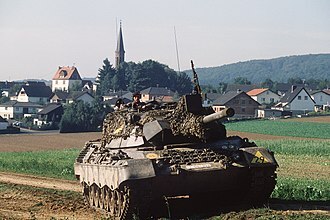 The German World War II Panther tank (and some Tigers) had double torsion bars. Needing bars longer than the width of the tank to get the required spring rate and maximum elastic bend angle from available steel alloys, designer Ernst Lehr created a suspension that effectively folded the bars in half. For each wheel, one rod was attached to the suspension arm, while another was mounted to a nearby point on the frame. On the opposite side of the tank, the two rods were attached to each other and fitted into a pivot. Deflection of the suspension arm caused both halves of the double torsion bar to twist. 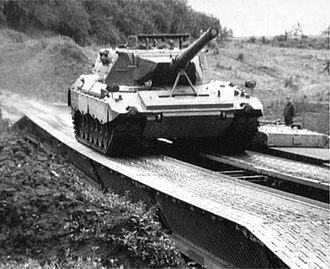 A disadvantage of the torsion bar suspension used in Tiger and Panther tanks (and many other WWII-era tanks and other AFVs) was the inability to incorporate an escape hatch through the bottom of the hull, a common feature of WWII-era tanks, as the torsion bar arrangement would have blocked crew access to such a hatch; however, the absence of leaf, coil or volute springs often left a large expanse of the side of the hull clear to include a side-escape hatch, and it was rare for a tank to be flipped over in such a way that all top-side hatches were unable to open, which is the purpose of ventral hatches. 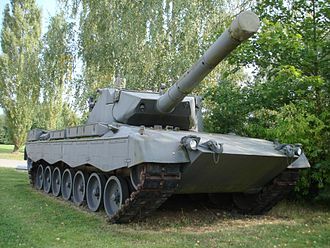 Many contemporary main battle tanks use torsion bar suspension, including the American M1 Abrams, German Leopard 2, and Chinese MBT-3000, though the newest generation of tanks such as the Russian T-14 Armata utilize an adjustable hydraulic suspension. Due to their small size, tremendous load capacity, and relative ease of service, torsion bar suspension has been ideal for tanks, though it is not without disadvantage. The large travel and high elasticity of the torsion bars results in a "rocking" motion when the tank is moving or coming to a sudden stop. 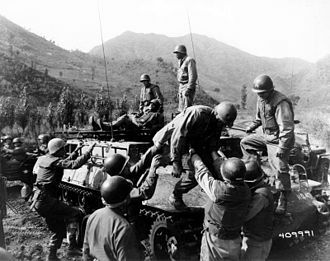 A gun stabilizer must be used to compensate for the rocking motion. 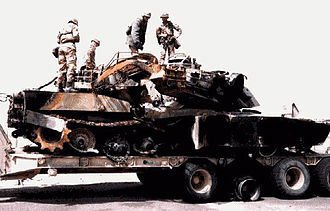 Due to the massive weight of a main battle tank, compared to an automobile, there is a much greater risk of breaking a torsion bar on sudden bumps or maneuvers, and if it is not replaced in short order the reduced suspension can affect the maneuverability of the vehicle, and in extreme cases risk immobilizing the vehicle as the reduced capacity of the suspension causes additional torsion bars to break. 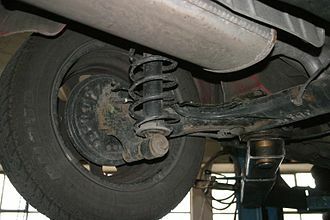 Some front-wheel drive automobiles use a related type of torsion beam suspension, usually called a twist-beam rear suspension, in which the rear wheels are carried on trailing arms connected by a laterally mounted torsion beam, as found on the Mitsubishi Debonair. The actual springing medium for these is usually coil springs. The torsion beam functions both as wheel locating arm and as an anti-roll bar to resist lateral motion of the wheels as the body leans in turns. Its advantages are that it is inexpensive to manufacture and install, and engages a minimum amount of interior volume, leaving more space for the carriage of passengers, cargo, and other components. Because the torsion beam acts in the lateral plane, not vertically, the twist beam axle cannot provide ride height adjustment, and it suffers, to some extent, similar car handling limitations as other beam axle suspensions. However these limitations may not be apparent on the road, because of the trend towards firmer, more sporty suspension setups with more limited wheel travel. Twist-beam rear suspensions were pioneered on the Volkswagen Golf in the early 1970s, and remain common on compact cars and minivans. Torsion bars were sometimes used instead of conventional coil valve springs in some older motorcycles, such as the Honda CB450, and also on the Panhard Dyna X and Panhard Dyna Z cars of the 1950s. They were also used in the door mechanism of the DMC DeLorean automobile. ^ Popular Mechanics - Google Books. Books.google.com. Retrieved 2015-03-03. ^ "Tatra T600 Tatraplan". Tatra T600 Tatraplan. Retrieved 2 April 2018. ^ a b "Armortek • View topic - Ultimathe Panther by Luca". Armortek.co.uk. Retrieved 2015-03-03. 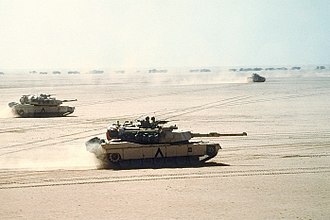 ^ "M1 Abrams Main Battle Tank". www.globalsecurity.org. Retrieved 2016-01-16. 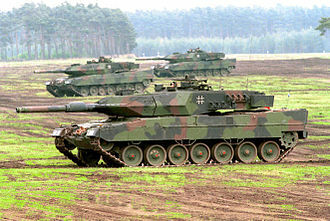 ^ "Main Battle Tank - Leopard 2". www.fprado.com. Retrieved 2016-01-16. ^ "The Chinese MBT-3000 Main Battle Tank - TankNutDave.com". TankNutDave.com. Retrieved 2016-01-16. ^ "Gur Khan attacks! : Активная подвеска танка "Армата"". gurkhan.blogspot.ru. Retrieved 2016-01-16. Isuzu Motors Ltd. trading as Isuzu, is a Japanese commercial vehicles and diesel engine manufacturing company headquartered in Tokyo. Its principal activity is the production and sale of Isuzu commercial vehicles, the company was established in 1916. In 1934, the company fused with the carmaker and was renamed Isuzu, Isuzu has assembly and manufacturing plants in Fujisawa, as well as in the Tochigi and Hokkaidō prefectures. Isuzu-branded vehicles are sold in most commercial markets worldwide, Isuzus primary market focus is on commercial diesel-powered truck and construction, while their Japanese competitor Yanmar focuses on commercial-level powerplants and generators. By 2009, Isuzu had produced over 21 million diesel engines, Isuzu diesel engines are used by dozens of manufacturers, to include Ford Motor Company and Renault-Nissan Alliance. Isuzu Motors history began in 1916, when Tokyo Ishikawajima Shipbuilding and Engineering Co. Ltd. plan a cooperation with the Tokyo Gas and Electric Industrial Co. to build automobiles. The next step is taken in 1918, when a technical cooperation with Wolseley Motors Limited is initiated, meaning exclusive rights to the production, in 1922 the first Wolseley model, the A-9 car, is domestically produced. The CP truck follows two years later,550 of these are built until 1927, in 1933, Ishikawajima Automotive Works merges with DAT Automobile Manufacturing Inc. and changes its name to Automobile Industries Co. Ltd. The products of company, marketed as Sumiya and Chiyoda, were renamed Isuzu in 1934, following a meeting with the Japanese Governments Ministry of Trade. The word Isuzu translated into English means fifty bells—hence the focus on bell in both the Bellel and the Bellett, in 1937 Automobile Industries is reorganized and formed into a new company, Tokyo Automobile Industries Co. Ltd. It was founded with a capital of ¥1,000,000, only in 1949 is Isuzu adopted as the company name. Meanwhile, in 1942, Hino Heavy Industries was split off from Isuzu, Truck production began anew in 1945, with the permission of the occupation authorities. The Mitsubishi Delica is a range of trucks and multi-purpose vehicles built by Mitsubishi since 1968. It was originally based on a pickup truck introduced the previous year, called the Delica. The passenger car versions were known as Delica Star Wagon from 1979 until the 1994 introduction of the Delica Space Gear, the most recent version is called the Delica D,5. With the exception of the generation, all five generations are still sold in various international markets. In Japan, the Delica Cargo nameplate was used on badge-engineered Mazda Bongos between 1999 and 2010, since 2011, the Delica D,2 name has been applied to a rebadged Suzuki Solio. The production of the Delica light commercial cab-over pickup began in July 1968 and it received the chassis code T100, in line with the recently introduced T90 Canter. Using a KE441,088 cc engine producing 58 PS, a year later, in line with consumer needs, a cargo van and a passenger van were added to the line-up. The passenger van, discontinued in 1976, was called the Delica Coach, the engine was upgraded to 62 PS in 1969. In March 1971 a slightly facelifted version, called the Delica 75 and this received a small grille rather than the naked metal front of the earliest Delicas, and a new 1. 4-liter Neptune engine rated at 64 kilowatts was added to the line-up. The smaller 1. 1-liter engine may have remained available in a 600 kilograms version of the truck but if so, after a fall 1974 facelift, the Delica received a new nose with lots of plastic cladding and double headlights, now mounted beneath the swage line. It was now only as the Delica 1400, as this was the only engine with which it was available. A longer wheelbase 1-ton truck was added in 1976, in export markets, this car was sometimes called simply the Colt T100 / T120. Record, a Greek manufacturer of vehicles, plagiarized the Delica T120 design for their fibreglass-bodied GS2000 truck. The Delica series was replaced in June 1979 by an all new design, bringing overall width up to the maximum 1, 690-millimetre dictated by Japanese regulations for compact vehicles. 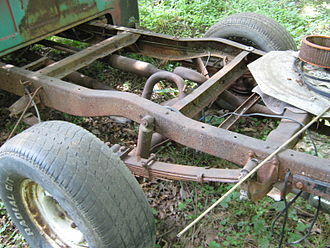 The twist-beam rear suspension is a type of automobile suspension based on a large H or C shaped member. The front of the H attaches to the body via rubber bushings, the cross beam of the H holds the two trailing arms together, and provides the roll stiffness of the suspension, by twisting as the two trailing arms move vertically, relative to each other. The coil springs usually bear on a pad alongside the stub-axle, often the shock is colinear with the spring, to form a coilover. This location gives them a high motion ratio compared with most suspensions, which improves their performance. The longitudinal location of the cross beam controls important parameters of the behaviour, such as the roll steer curve and toe. 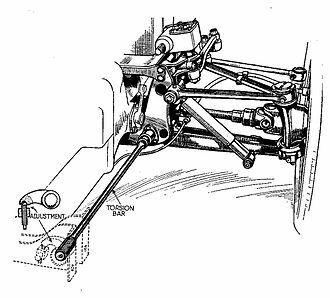 The closer the cross beam to the axle stubs the more the camber, a key difference between the camber and toe changes of a twist beam vs independent suspension is the change in camber and toe is dependent on the position of the other wheel, not the cars chassis. In a traditional independent suspension the camber and toe are based on the position of the relative to the body. If both wheels compress together their camber and toe will not change, thus if both wheels started perpendicular to the road and car compressed together they will stay perpendicular to the road. The camber and toe changes are the result of one wheel being compressed relative to the other and this suspension is commonly used on a wide variety of front wheel drive cars, and was almost ubiquitous on European superminis. It was popularised by Volkswagen when they changed from rear engined RR layout cars in the 1970s and this can mildly compromise the handling and ride quality of the vehicle. For this reason, some manufacturers have changed to different linkage designs, general Motors in Europe Vauxhall/Opel have continued to use twist- or torsion- beam suspension. This is at a cost saving of €100 per car compared to multi-link rear suspension and their latest version as used in the 2009-on Opel Astra uses a Watts linkage at a cost of €20 to address the drawbacks and provide a competitive and cost effective rear suspension. A sport utility vehicle or suburban utility vehicle is a vehicle classified as a light truck, but operated as a family vehicle. They are similar to a station wagon or estate car. Some SUVs include the capacity of a pickup truck with the passenger-carrying space of a minivan or large sedan. Popular in the late-1990s and early–mid-2000s, SUVs sales temporarily declined due to oil prices. The traditional truck-based SUV is gradually being supplanted by the crossover SUV, by 2010, SUV sales around the world were growing, in spite of high gas prices. According to the Merriam-Webster dictionary, a utility vehicle is a rugged automotive vehicle similar to a station wagon. The SUV term is defined as a vehicle that is designed to be used on rough surfaces. The SUV acronym is used to describe nearly anything with available all-wheel drive. There is no one definition for an SUV, Most government regulations simply have categories for off-highway vehicles, which in turn are lumped in with pickup trucks and minivans as light trucks. The auto industry has not settled on one definition, starting in 2004, the United States Environmental Protection Agency began to hold sport utility vehicles to the same tailpipe emissions standards as cars. 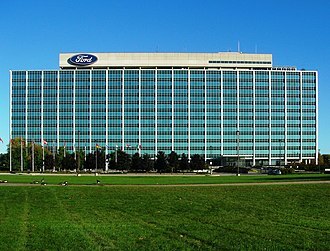 Many people question how can an SUV be called a truck, for industry production statistics, SUVs are counted in the light truck product segment. Not all SUVs have four-wheel drive capabilities, and not all passenger vehicles are SUVs. While automakers tout an SUVs off-road prowess with advertising and naming, in India, all SUVs are classified in the Utility Vehicle category per the Society of Indian Automobile Manufacturers definitions and carry a 27% excise tax. Those that are 4 metres long, have a 1,500 cc engine or larger, although designs vary, SUVs have historically been mid-size passenger vehicles with a body-on-frame chassis similar to that found on light trucks. Early SUVs were mostly two-door models, and were available with removable tops, consumer demand pushed the SUV market towards four doors, by 2002 all full-size two-door SUVs were gone from the market. Groupe Renault is a French multinational automobile manufacturer established in 1899. The company produces a range of cars and vans, and in the past has manufactured trucks, tanks, buses/coaches, the Renault–Nissan Alliance is the fourth-largest automotive group. Renault has a 43. 4% controlling stake in Nissan of Japan, a 37% indirectly-owned stake in AvtoVAZ of Russia, Renault owns subsidiaries RCI Banque, Renault Retail Group and Motrio. Renault has various joint ventures, including Oyak-Renault, Renault Pars, Carlos Ghosn is the current chairman and CEO. The French government owns a 19. 73% share of Renault as of April 2015, Renault Trucks, previously known as Renault Véhicules Industriels, has been part of Volvo Trucks since 2001. Renault Agriculture became 100% owned by German agricultural equipment manufacturer CLAAS in 2008, together Renault and Nissan invested €4 billion in eight electric vehicles over three to four years beginning in 2011. Renault is known for its role in sport, particularly rallying, Formula 1. 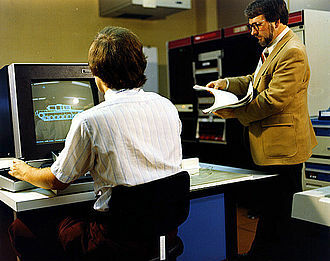 Its early work on mathematical curve modeling for car bodies is important in the history of computer graphics, the Renault corporation was founded in 1899 as Société Renault Frères by Louis Renault and his brothers Marcel and Fernand. While Louis handled design and production and Fernand managed the business, the first Renault car, the Renault Voiturette 1CV, was sold to a friend of Louis father after giving him a test ride on 24 December 1898. In 1903, Renault began to manufacture its own engines, until it had purchased them from De Dion-Bouton, the first major volume sale came in 1905 when Société des Automobiles de Place bought Renault AG1 cars to establish a fleet of taxis. 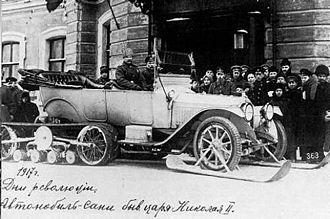 These vehicles were used by the French military to transport troops during World War I which earned them the nickname Taxi de la Marne. By 1907, a significant percentage London and Paris taxis had been built by Renault, Renault was the best-selling foreign brand in New York in 1907 and 1908. 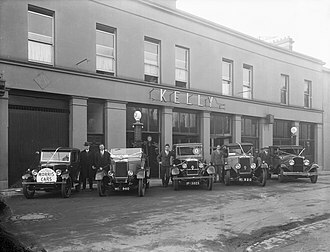 In 1908 the company produced 3,575 units, becoming the countrys largest car manufacturer, the brothers recognised the value of publicity that participation in motor racing could generate for their vehicles. The Morris Minor is a British car that debuted at the Earls Court Motor Show, London, on 20 September 1948. Designed under the leadership of Alec Issigonis, more than 1.3 million were manufactured between 1948 and 1972 in three series, the MM, the Series II and finally the 1000 series. It was the first British car to sell one million examples and is considered a classic example of automotive design. The Minor was conceived in 1941, vic Oak, the companys chief engineer, had already brought to Thomas attention a promising junior engineer, Alec Issigonis. Issigonis had been employed at Morris since 1935 and specialised in suspension design, Issigonis had come to Oaks particular attention with his work on the new Morris Ten, which was in development during 1936/7. 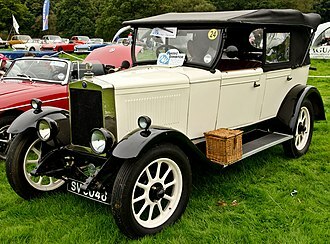 This was the first Morris to use unitary construction and was conceived with independent front suspension, Issigonis designed a coil-sprung wishbone system which was dropped on cost grounds. 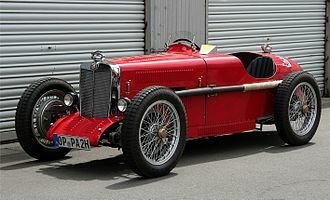 Although the design would be used on the MG Y-type, despite his brief being to focus on the Tens suspension Issigonis had drawn up a rack and pinion steering system for the car. With virtually all resources required for the war effort, Thomas nonetheless approved the development of a new family car that would replace the Morris Eight. Although Oak were in charge of the project it was Issigonis who was ultimately responsible for the design. 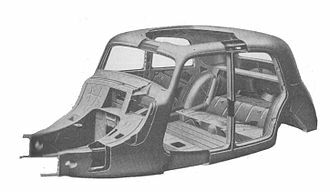 Issigonis wanted the car to be as spacious as possible for its size, Issigonis design included the same ideas he had proposed for the Ten before the war, Independent suspension and rack and pinion steering plus the continued use of unitary construction. The French car, launched in 1934, had been an example of rack. 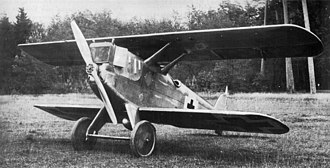 Nearly every feature of the Minor serves the joint aims of good roadholding, for example, Issigonis specified 14-inch wheels for the Mosquito. These were smaller than any production car of the time. These small wheels reduced intrusion into the space and minimised unsprung mass for better ride comfort. 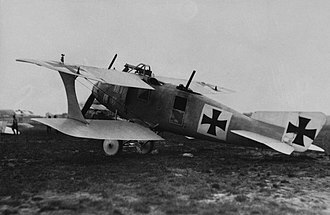 The wheels themselves were placed as far as possible in each corner of the Mosquitos floorpan for the same reasons, the same went for the placement of the engine, far towards the front of the engine compartment. T-72 monument in its production place, Nizhny Tagil. Memorial of a T-72 with ERA in Askeran, Azerbaijan. The tank was advancing on Azerbaijani positions in Askeran when it hit a mine and its Armenian crew was killed in the resulting explosion. 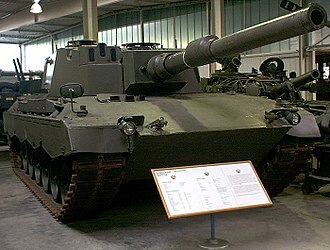 The tank was restored after the war. T23 with production cast turret mounting 76 mm M1A1 gun. 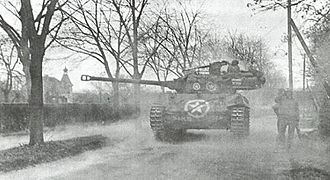 The T23 turret would be used for the 76-mm M4 Sherman. Note the vertical volute spring suspension. Single prototype of 90 mm gun T26 turret mounted on an M4A3 chassis. Citroën CX in high position. 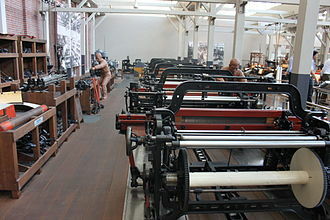 The machine factory (shown here in a company letter of 1910) founded by Demosthenis Issigonis, Alec's grandfather, once a thriving Greek businesses in Smyrna (now Izmir). 1971 Morris Marina 1.8 TC 4-door saloon. 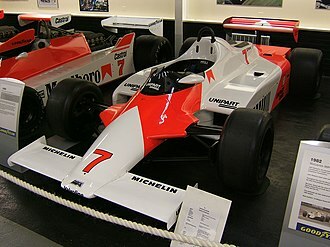 The 1.8 TC was marketed as the sporting version. The high visibility "safety colour" of this example was fashionable in the 1970s. 1975 Marina Pick-up. This variant was never a big seller.